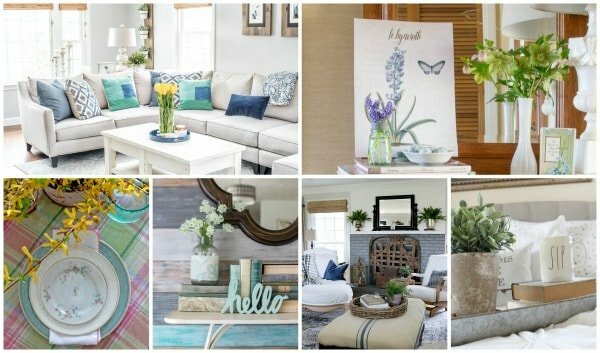 Simple ideas to add a little Spring Décor to your home….Decorating for Spring the Easy Way! My friend Jenna from the blog Wife in Progress gathered a big group of décor bloggers (30 to be exact but who’s counting) and asked us to share some of our spring décor ideas. I’m really excited to join in (despite the fact that we’re still getting snow here) because I’m ready to decorate for spring! I started off by thinking of about a 100 different ideas to deck out my home from top to bottom in the springiest of spring ways when something unusual happened, I had a rare moment of rational thinking. I know! Weird right? Anyway, It occurred to me that what goes up must come down. That wouldn’t be a big deal if it weren’t for the fact that, not only am I the chief decorator in the house, I’m also the chief putter awayer. For the record, I’m horrible at that second part and would like to be fired but my family refuses catch on. Dang it. I started by looking around my house for items I already had. I also stopped over at my Mom’s house to see what I could dig up in her basement. That’s always fun because it’s like a treasure hunt over there and we both have a good time going through the things. I scooped up this platter my mom painted some 40 years ago during one of her pottery craft phases. It’s been around forever and when I look at it, it reminds me of what I love about my mom. I had to display it. For the flowers, I used a plain concrete bowl that my girlfriend told me was too plain. We decided it needed moss so we sat in my kitchen gluing on moss and happily killing my kitchen with craftiness. The flowers came from my local grocery store. Heinen’s Grocery in Cleveland. The grocery store is also where the bowl of Primrose came from. I think it was around 5 or 6 dollars. All I had to do was place the plastic pot in one of my white dishes. Creating a spring table was a fun project. I picked up a fabric remnant from my favorite fabric store here in Cleveland (schindlersfabrics) and made a quick runner and placements. I think the remnant was around 6 dollars. I already had the dishes but I did purchase the egg cups from Homegoods. They were a little on the boring side so I wrapped them in grapevine twine and made them into birds nests. I love them now! I also used the grapevine to make mini birds nest for the napkins and the napkins came from a tablecloth that I cut up. I didn’t go crazy but it’s enough that the house is already feeling more cheery. I may add a few more spring items around the house but honestly I’m trying hard to resist that temptation and focus on spring cleaning and decluttering. 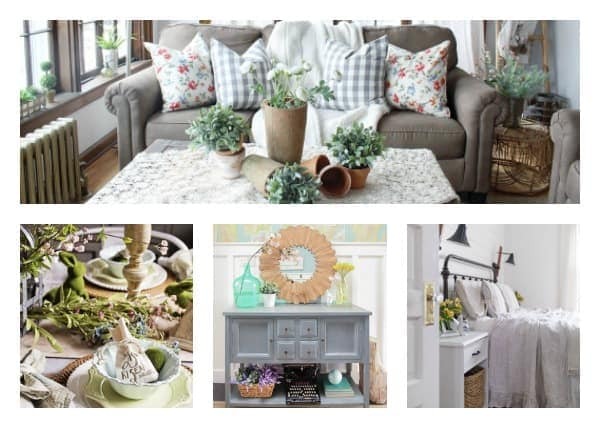 Fortunately there are lots more ideas to check out in the Styled for Spring Blog hop. See the links below! You are hysterical! Chief putter upper – yep! I get that. It’s all fun and games until you’ve got to take it down. And this is my first time visiting your blog, but I had a nice laugh at your bio “all the crafty crap I make”. I love it – sounds very familiar! Beautiful table and I am so glad you rescued that platter – it’s amazing! Such a perfect example of how beautiful spring decor doesn’t have to be complicated. Gorgeous! I love the pink plates and glasses, they add the perfect subtle pop of color! And those little nests on the egg cups are fantastic!! I completely understand not wanting to get a lot of decorations out because you don’t want to put them away. I learned my lesson recently when there were still totes of Christmas stuff waiting to be put away, in February!! The egg cups with the nests are TOO cute!!! Thanks Jenna, they fun to make. Jenny, your spring table is looking awesome, girlfriend. I love the brilliant pop of color that the African Violets give. And those little nests are precious and so cute as napkin rings. What a sweet way to set your table. So happy to be on the Spring Home Tour with you. Thank you Carol. I was thrilled to see your name on the list too! Jenny your home is so pretty and all of your pictures are gorgeous. I love the egg stands with nest that you made! You are so talented!! Those bird nests are the true stars! I just smiled when i looked at them! Oh my gosh. Those mini birds nests used as napkin ring holders are honestly the CUTEST thing I have seen in years. They are so sweet! I love it all. Thank you for sharing. I just love that black and white chest!! And love that you take (borrow!) decor from your Mom, I do the same! Jenny! I love this so much! Those teeny tiny bird nests are the absolute cutest! And I’m all about simplicity in decor – being the same chief putter awayer here too! If only we were closer – we could help each other out! Thanks for the inspiration!